They were believed to be dogs of wars for the Roman Army and possibly even for the Egyptians, Persians, Mesopotamians and Mongols in 3000 B.C.E. For the last two millennia they were dogs on farms in Italy. Breeders in Southern Italy worked on getting the size, the skin folds and the dewlap to perfection. It was made to be a guard dog and keep unwanted intruders off the property. After World War 2, they were recognized as an Italian "treasure". In 1948, a standard was written which was later refined in 1971. An exhibition was held in Naples in 1946 with 6 Neo's presented; it was the first. By the early 1970's, Germany and the U.S were fascinated with the breed. Is an ancient breed that was rediscovered in Italy in the 1940's. Is known for their loose skin folds. 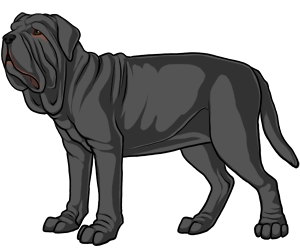 Neapolitan Mastiff, in Italian, is Mastino Napoletano. Was originally bred to be a guard dog.